There are 5 desktop wallpapers listed below. The files are sorted by the date they were posted to the site, beginning with the most recent content. Nature's Echo: reflection at it's finest here! 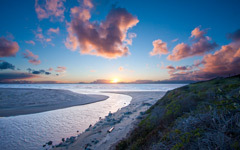 This shot was taken at a pull-out above North Salmon Creek Beach. 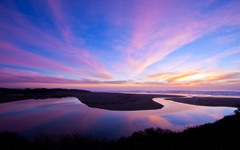 It's a shot of Salmon Creek running into the ocean, the colors were incredible. 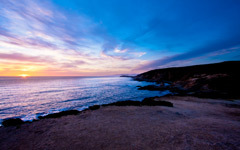 A nice winter Bodega Bay Sunset!. This shot was taken on an incredibly windy, cold evening after work. I was headed home over Coleman Valley and pulled over and got stuck in the mud. So while waiting for a tow truck I hiked up a hill and found a nice viewpoint. Luckily it took the tow truck a while so I was there for the perfect moment just after sundown to get that incredible golden light in the shot! Canon EOS 40D, Canon EF-S 10-22mm f/3.5-4.5 USM, Manfrotto tripod, Adobe Lightroom 3. I was staying in Bodega Bay when I took this photo; and you just never know when the fog will lift, but sometimes when it does it's beautiful! It was pretty windy and cold but nonetheless beautiful! It's a little dark to the right in my opinion but the dark contrasts well with the vibrant sunset colors. 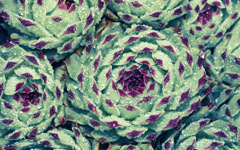 This is a succulent plant we have at my house and I love the patterns in it, especially with the rain drops. I used the macro lens to capture the droplets! Hope you enjoy. Canon EOS 40D, Canon EF 100mm f/2.8 Macro USM, ISO 100, f/5.6, 1/50 second, Manfrotto tripod, Adobe Lightroom 3. 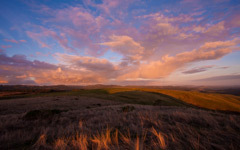 This shot was taken on an incredibly windy evening in Bodega Bay! It's taken from a pull out off of Highway 1, and overlooks Salmon Creek running into the Pacific Ocean at North Salmon Creek Beach. It's two shots, 1 exposed for the sky and 1 exposed for the foreground. I used masked layers in Photoshop to blend the two together. I'm pretty happy with it, wish it was a tad more in focus but I feel the wind contributed to that a lot as well! Canon EOS 40D, Canon EF-S 10-22mm f/3.5-4.5 USM, Manfrotto tripod, Adobe Lightroom 3, Adobe Photoshop CS5.